In moments of post-truth despair, I take small comfort in the idea that history itself is but a chronicle of selective mis-remembering, which refocuses attention on who is exercising such selectivity and why they are doing so. There are aids that help with this kind of refocusing, some being what might be called “the official record,” which is in fact a documentary archive of encounters between the apparati of state power and those who were and still are subjected to it. Almost everybody has some space assigned to their lives in such archives, but those individuals who have run afoul of the criminal (in)justice system have more than an equal share. Prior to the emergence of the post-9/11 surveillance state, this was even more the case, and old timey mug shots taken after police arrests remain the most common forms of visual evidence of those encounters. sparked a 381-day boycott that was finally resolved by a Supreme Court ruling ordering the Montgomery City Transit operation to change its policy on the grounds that it violated the equal protection clause of 14th Amendment. The ruling should have been unnecessary because two years earlier, the SCOTUS had already overturned the doctrine of “separate but equal,” which was the legal rationalization for segregationist policies that had been in effect since the end of the Civil War. 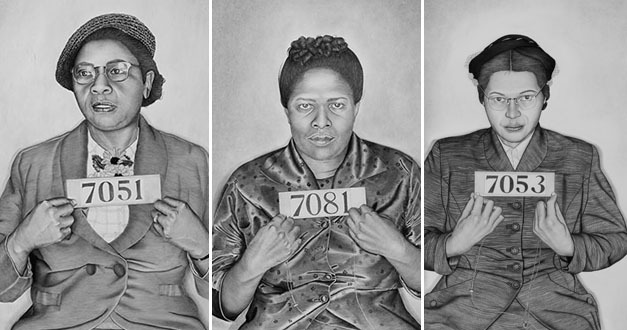 And while it is worth noting that there were many African-American men who led and/or participated in the boycott, including Ralph Abernathy and Martin Luther King Jr., the artist chose to focus on the women because their critical role in the boycott's success," she says, "is not widely known." 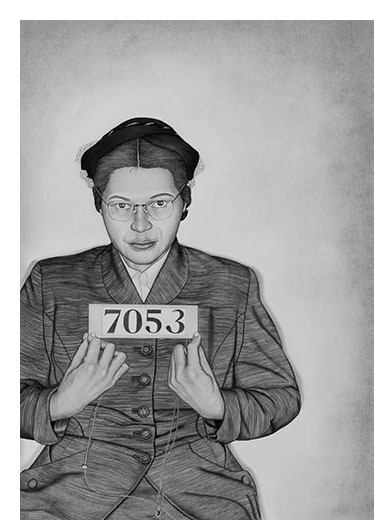 Ida Mae Caldwell, 2018, graphite and conté pencil on paper 48 1/4 x 34 1/2 inches. the viewer with downcast eyes and body postures that bespeak physical and psychic exhaustion. But tribulation notwithstanding, they are still undefeated, as Thomas’ drawings make clear. 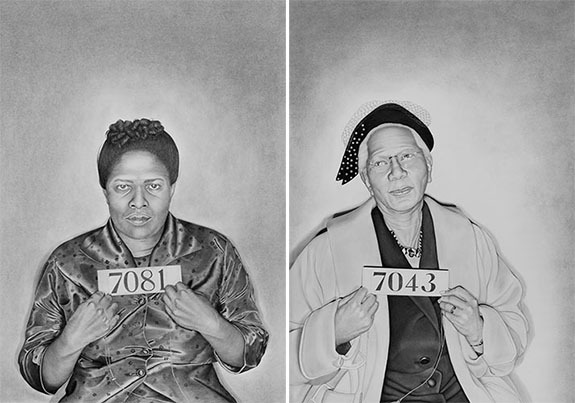 In our own racially charged moment of racialized political rhetoric and controversies about widespread sexual assault, these works achieve a special resonance; but we should also remember that they reflect back on an older time before social justice activism was unburnished by hashtag adornments. The exhibition also contains two groups of other works by Thomas. One of these is the partial text of the Voting Rights Act of 1965 embossed into dark leather in the configuration of an American flag. 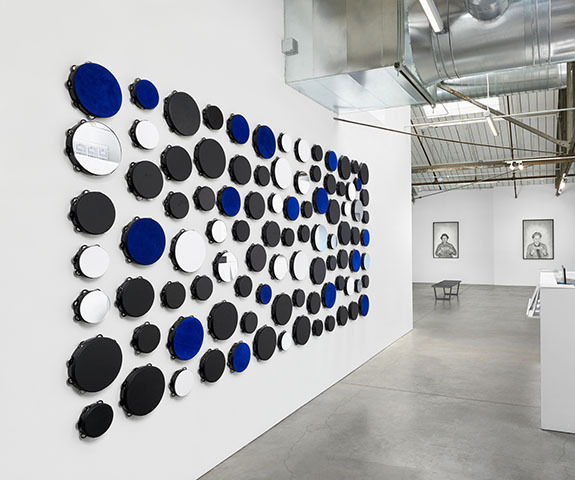 The other are collections of tambourines (see above) arrayed across a wall, some covered in black leather, others sporting shiny, mirrored surfaces, and still others a bright, flat color. The tambourine works are interesting to look at, but the message they convey may be a bit too subtle –or insular—for many viewers. I take them to be clarion symbols of a call to righteous action articulated within the African-American community, specifically the African-American religious community where gospel music and the church remain to this day a locus of organized resistance. One need only replay any number of old gospel standards to hear the message of that instrument ringing. 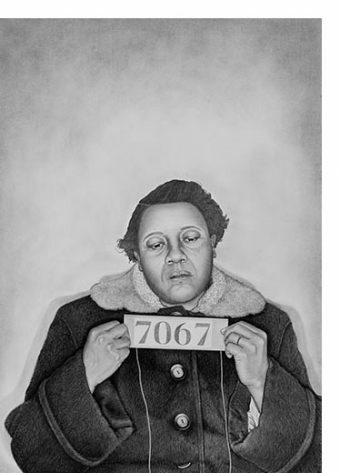 Lava Thomas: "Mugshot Portraits: Women of the Montgomery Bus Boycott" @ Rena Bransten Gallery through October 27, 2018.